The Office for National Statistics (ONS) recently released some new figures which, on the face of it, would appear to be very good news for young people. According to their latest analysis, the number of young adults aged 16–24 in the UK who are classified as NEET (Not in Education, Employment or Training) has continued to fall during the second quarter of 2018, building on the steady reduction in youth unemployment which has been evinced since the Global Financial Crisis of 2008. The figures reveal that the reduction in the number of NEETs has largely been achieved through a fall in the number of NEETs who were unemployed; this improvement in the level of youth unemployment plays into the broader narrative surrounding the UK’s so-called “jobs miracle”, which has seen the UK’s official measure of unemployment fall to just 4.2%, its lowest level since the 1970s. However, is the story really that straightforward? In particular, should we be concerned about whether these figures mask a more complicated reality, in which thousands of young adults who are officially “employed” are really stuck doing low-skilled, low-paid forms of work which are often temporary and insecure? Falling unemployment: too NEET an explanation? The fall in the number of NEETs which has been recorded in the official data since the beginning of the economic crisis in 2008 has been very impressive. A “NEET” is someone aged 16–24 who is not enrolled in any form of education or training, or doing a paid job. The total number of young adults who are classified as NEET stood at 783,000 in the latest figures, which equates to 11.2% of everyone in that age group. 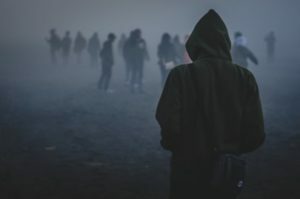 At the beginning of the global financial crisis in 2008 approximately 13.4% of people in this age group were classed as NEET, amounting to 1.25 million people, so the number has gone down by almost 500,000 people in roughly a decade. One could easily argue that for more than one in ten young adults to still be classified as NEET is still far too many, although the long-run trend prior to the crisis was generally for around 13% of people in this age group to be NEET; so the current level is actually slightly better than it was during the years of plenty before 2008. Within the group of young people who are classed as NEET, an important distinction is drawn between those who are willing and able to work (economically active NEETs) and those who, for whatever reason, are not (economically inactive NEETs, who, for example, may be full-time carers or disabled). The vast majority of the young adults who are NEET actually fall into the latter category, economically inactive NEETs: 37.4% of NEETs are looking for work and therefore classed as unemployed, which means that almost two-thirds are not. This means that there are actually only around 293,000 young people who were classified as unemployed, a number which the new data suggest had fallen by 32,000 over the previous 12 months. The key question is whether this decline in the number of unemployed NEETs has led to an improvement in their circumstances. As you would expect, policy-makers and the media nearly always present a decline in unemployment as unalloyed good news, but this assumption seems to have become increasingly questionable in light of the major shifts that have occurred in the UK’s labour market during the last couple of decades. High youth unemployment is often seen as an especially urgent social problem for a number of reasons. Firstly, it wastes the potential of young people, who could otherwise be developing their skills and gaining workplace experience if they were able to access the world of work. Secondly, policy-makers tend to be especially concerned about it because of the expense of providing unemployment benefits and because under-employed young adults (particularly men) are more likely to become involved in committing crime and anti-social behaviour. And thirdly, academic research has demonstrated that there tends to be a “wage scarring” effect, in which young adults who endured a significant period of unemployment near the beginning of their careers have been found, decades later, to still be earning less than their counterparts who weren’t unemployed: one study from the University of Bristol found that a period of unemployment during someone’s early twenties was associated with a 12–15% wage penalty when they reached their early 40s. This is why so much attention is usually given to youth unemployment by policy-makers, because excessively high youth unemployment is bad for the future of the economy as a whole. However, the risk of trying to reduce youth unemployment (or unemployment in general, though possibly not to quite the same extent) is that it results in a desire to get unemployed young people into work at any cost. Both carrot and stick approaches to dealing with the problem can produce the same negative outcome, for example, if either unemployment benefits are cut in an attempt to force jobless youngsters to accept whatever forms of work they can find, or if the government ends up subsidising too many low-quality jobs through work guarantee schemes and similar initiatives. Within the field of wellbeing economics, there is now a hugely important debate being had over whether the cost to an individual’s wellbeing of being compelled to do a job they don’t enjoy (for example, because it is degrading, highly stressful or dangerous) is actually greater than the harm which is done by being unemployed. Good work or bad work? Given the extent to which casual and more insecure forms of work have become ubiquitous within certain sections of the British economy, it may not be a good thing if the reduction in the number of NEETs has been achieved to a large extent by young adults taking on these undesirable kinds of work. Although the issue still hasn’t been widely studied, some research has started to suggest that having a number of very short-term, low-skilled jobs near the beginning of a worker’s career may also create a wage-scarring effect in the future; more research is clearly needed to try and work out what its magnitude is compared with the scarring effect of being unemployed. Although we don’t know exactly how many young adults do insecure forms of work, we do know that they are disproportionately likely to be employed using zero-hours contracts, for example. Certainly, in the popular imagination the rise of the so-called “gig economy” – think Uber drivers, self-employed Amazon delivery men and women, and Deliveroo cyclists – tends to be closely associated with members of the Millennial generation. Research for the charity Citizens Advice has estimated that there are somewhere between 4.5 million and 10 million workers in the UK whose work could be considered insecure (a figure which does not include the self-employed). Given the rise of insecurity, it is perfectly legitimate to question whether a fall in the headline figures for youth unemployment should automatically be seen as a positive development.